NOV. 9, 2015  It may start as a simple lump in the throat, but before long your feet command you to stand and your eyes refuse to hold back the tears. Few are immune to the swell of emotion that takes over when marching bands across America celebrate their love of country and pay tribute to Veterans with patriotic music and our national colors of red, white and blue. Whether in a military unit or a high school group, the display of patriotism in marching bands is alive and well. In honor of Veterans Day on November 11, we selected some memorable photos that have appeared on Marching.com in recent years. Then we asked the people involved with each production to tell us about the moment and how it affected the crowd. Patriotism is strong in the Homewood High School Marching Band. The uniforms: red, white and blue. The nickname: patriots. The motto: "Pride, Perfection, Professionalism." 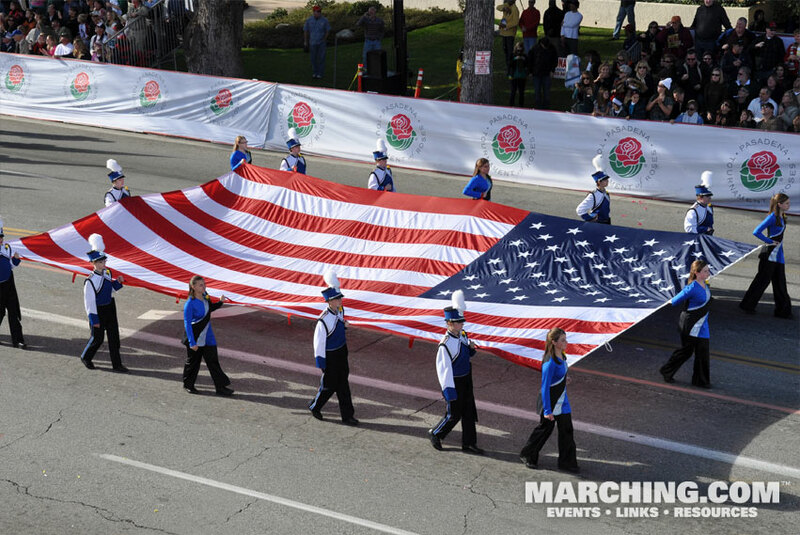 It's easy to see why the band has been invited to the Tournament of Roses in Pasadena four times. The band's field show performance at Bandfest ahead of the 2014 Rose Parade was a showstopper. "We wanted to pay tribute to our nation's veterans," director Ron Pence said. "The title of our 2013-2014 production was 'Star Spangled Spectacular.' There always seems to be a large number of veterans in attendance at Bandfest, and we wanted to honor our nation's heroes." The climactic moment at the end of the show was unforgettable. While the band played an excerpt from the National Anthem, band members raised a gigantic backdrop depicting the silhouette of a soldier saluting the American flag. "We received standing ovations and compliments from spectators all season long," Pence said. "After this particular performance, author Tom Ruck sent us a nice note of appreciation and a copy of his book, 'Sacred Ground: A Tribute to America's Veterans.'" 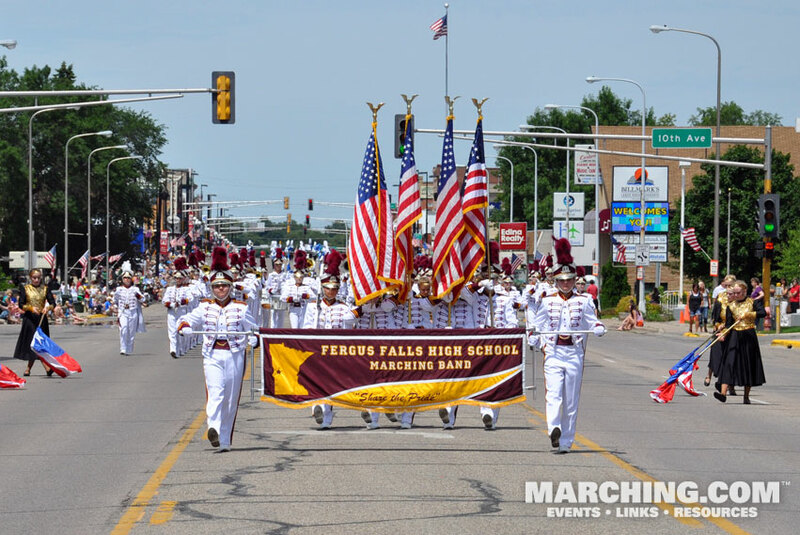 The Fergus Falls High School Marching Band has developed a distinct style and regularly performs patriotic shows that honor veterans and our flag. The band actively marches during Minnesota's summer parade season, and has appeared at the Vikingland Band Festival parade marching championship in Alexandria, Minnesota, for more than 25 consecutive years. Fergus Falls is a past "People's Choice" award winner from the event. "We are always well-received by audiences because of our patriotic music and traditional marching," director Scott Kummrow said. "It has really become the identity of our band." The 2012 program was titled "Salute to the Armed Forces." The band performed the official song and carried the official flag of each military branch, in addition to carrying multiple American flags. In recent years the band has also built shows around themes such as the Civil War and historic American flags. Regardless of the theme, Kummrow tries to incorporate several popular elements into every show. "Almost without exception, you will hear the band perform the finale to The Stars and Stripes Forever," Kummrow said. "The band also sings a portion of each show, usually a rendition of Yankee Doodle Dandy." "The Armed Forces show was special. I received many emails during the season, and many handshakes and thanks on the streets," Kummrow said. "We actually shed some tears that season because of the connections we made. I don't know how to properly describe the image of a veteran standing up and saluting as his service flag is flown through the middle of the band. It gives me chills." Bands that gather in Pasadena to march in the Tournament of Roses Parade come a few days early to perform their field shows for large crowds of enthusiastic spectators at "Bandfest." On occasion, the U.S. Marine Corps makes a very special guest appearance. "Everyone wishes they could perform each and every year," said Jim Hahn, music advisor to the Pasadena Tournament of Roses and master of ceremonies for Bandfest. 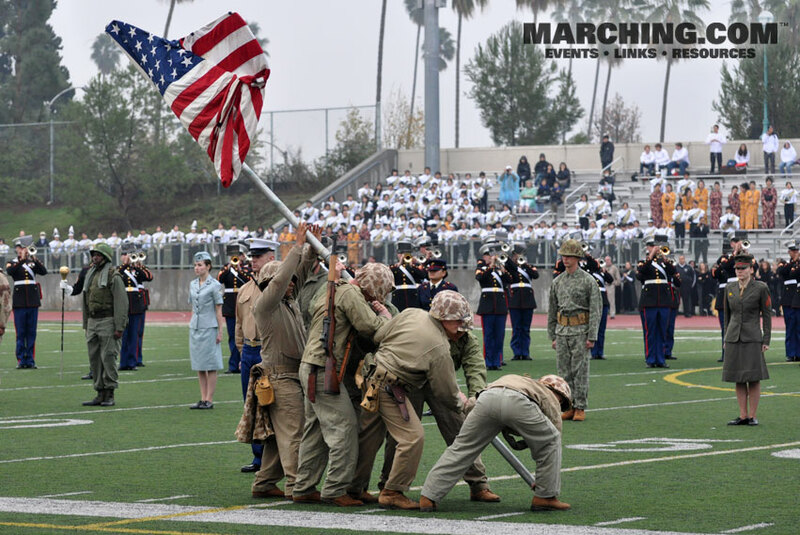 "Any time we are fortunate enough to have the United States Marine Corps West Coast Composite Band perform at Bandfest, we are beyond honored." The Marine Band performance ends with a dramatic segment that honors the history of the Marines. With the band playing slow and deliberate arrangements of Hymn To The Fallen and The Marines' Hymn, a narrator tells a story while Marines depicting uniforms from 1775 to the present march onto the field. As the music continues to build, Hahn explained, a group of Marines rush "from out of nowhere" and in an instant re-enact raising the flag on Iwo Jima. Hahn has a field-level vantage point where he is able to observe the performance as well as the spectators. "The reaction of the crowd, including all of us on the sidelines, is unparalleled," Hahn said. "I have seen grown men literally sobbing and absolutely everyone is on their feet applauding. As the emcee of Bandfest, I have found it hard to speak after this performance." Although Veterans Day celebrates the service of all U.S. military veterans, the 2014 production from the Dobyns-Bennett High School Marching Band paid tribute specifically to fallen soldiers. The combination of musical selections and visual images was mesmerizing, and the strong performance propelled the band to a semi-finalist position at the prestigious Bands of America Grand National Championships. The show was titled "And I Will Wait..." and ended with the entire band disappearing behind props. The final image was a field covered with only the hats of the band members, and figures saluting half-staff flags at the base of grave markers. The moment was so moving that the crowd held silence before finally erupting into applause. "The idea for the show grew from our desire to use the melody Danny Boy in a new and meaningful way," director Lafe Cook said. "That evolved into 'Danny' being the central figure as a World War II G.I. who went off to war, leaving behind his love. The show reflects Danny's hometown pride in his defense of our country, the loneliness and fear of being in war far from home, and ultimately his sacrifice in defense of freedom." "We received dozens of emails after our Grand Nationals performance," Cook said. "My favorite was from Drum Corps International CEO Dan Acheson who wrote to extend his appreciation and tell us how moved he was by our performance." It's not every day a marching band gets escorted down Colorado Boulevard by Navy fighter jets. That once-in-a-lifetime experience happened for members of the Danvers High School Marching Band during the 2010 Tournament of Roses Parade. 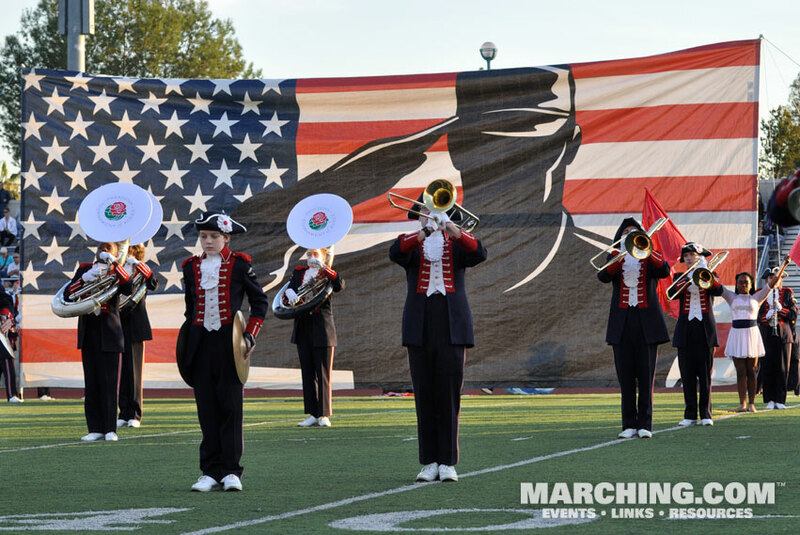 The band's show for the season was titled "A Tribute to America" and was specifically designed to showcase a large American flag that had been donated to the band. "When we shared our show theme with the Tournament of Roses, they asked if we would be willing to be the 'finale' to the Rose Parade," director Ronald A. Parsons said. Plans were set in motion, and the Tournament of Roses coordinated a flyover that was timed to occur as the band  with the giant flag  turned the famous "television corner" onto Colorado Boulevard. "The students had tremendous focus," Parsons said. "They knew their stride and pace had to be exact so the band would be at the corner precisely when the jets flew over. There was a sense of relief and excitement as the jets roared over the corner and the students knew that our timing was perfect!" "The audience stood and applauded all along the parade route as we approached playing a medley of patriotic music and carrying the flag," Parsons said. 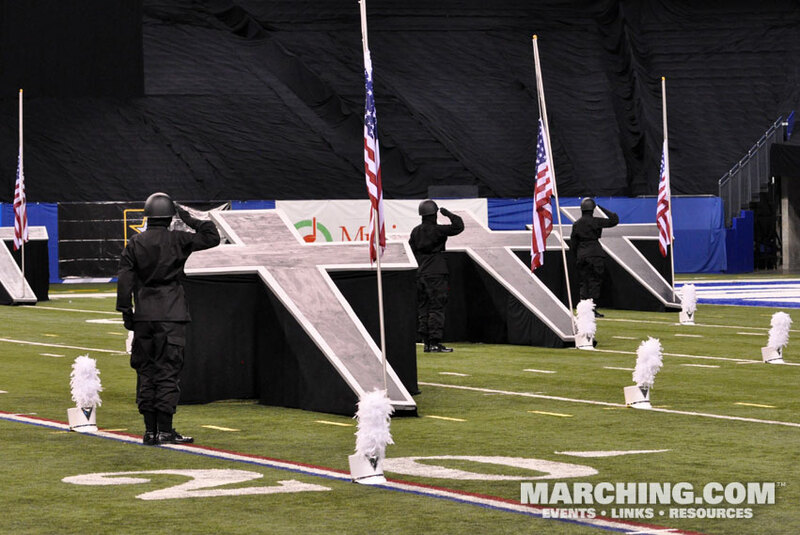 "Veterans in the audience were especially moved by our performance. We received many words of appreciation along the parade route, and messages of thanks arrived for several months from viewers who had seen the parade on TV."